A 100th birthday is definitely something to celebrate, therefore pick up a pair of these Assorted "100" Glittered Foil Eyeglasses (1/pkg) for each of the party guests. With these Assorted "100" Glittered Foil Eyeglasses your party guests can add a colorful decorative aspect to the birthday celebration. 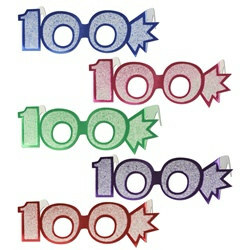 This inexpensive party supply can also be given to students to celebrate the 100th day of school. good for people of all ages; loosens up the crowd!! This was a great way to keep the young ones entertained and they lasted too. These were a great success. A good ice breaker before our guest of honor arrived. Festive but not gaudy. Sparkle-y but no glitter falling off. A little too big for the children; have some bobby pins on hand. I predict these will be one of the highlights of the party, based upon how much my co-workers seemed to like them.